Qunu is a next-generation expertise matching service. It uses instant messaging to connect -- in real time -- people who have software or tech-related questions with experts who are passionate and willing to help. How to get started as an expert: It's easy. 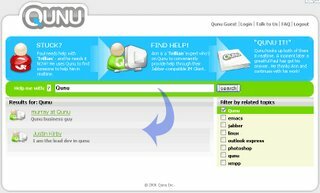 First, add quser@qunu.com to your contact list in almost any Jabber-enabled IM client. Then, request authorization and follow the instructions given to 'tag' yourself with various topics. Yes,you need register, it is free.